Setting a Playback Range to define the limits of an APT or Doubler process is one of the fastest and efficient means for breaking up the signal into processing sections. In this section we will show how to quickly create two processes with a minimum of keystrokes. The basic idea is that the New Process window, shown below, (which can be toggled open and closed with the B key), detects when a Playback Range (shown at the top of the window below) is created or adjusted. 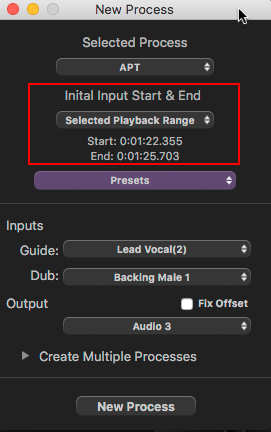 If it is, then Selected Playback Range is selected automatically in the New Process window and displayed under Initial Input Start & End, with the correct range set as shown in the picture left in the red box. Once the process range is set, the user only needs to press the N key on the keyboard (or the New Process button in the New Process window) to create the new Process Control Blocks as shown below (APT:dub unprocessed). Processes created this way will use the selected preset settings. Changing Settings are discussed further in the Processes chapters. 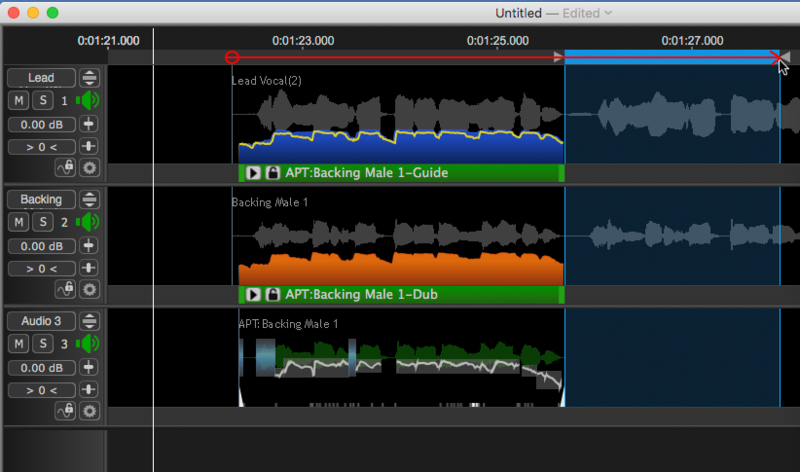 If that process sounds OK, to create another process quickly, a new Playback Range can be created by clicking and dragging in the Playback Range Track where it is wanted. One special trick for creating a Playback Range that starts where the last one ended, is to drag the start triangle of the previous Playback Range across the end of that playback range and on to the right to where the new end will be wanted. Below, the red circle and arrow show the start and end of this drag movement and the result is shown below. Pressing the N key while the New Process window is open will create the new process (APT:dub unprocessed(2)) as before and pressing the space bar will render the output and play the new output range as shown below.